Do you think about starting a new business? You’re not alone. According to statistics provided by the United States census, more than 400,000 new businesses were started in 2014 alone. That number is lower than the totals for previous years, but it tells us that entrepreneurship is still thriving. In total, the United States economy has more than 27 million entrepreneurs. And while some small businesses face challenges, some prove to be life-changing both for their founders and the people they employ. 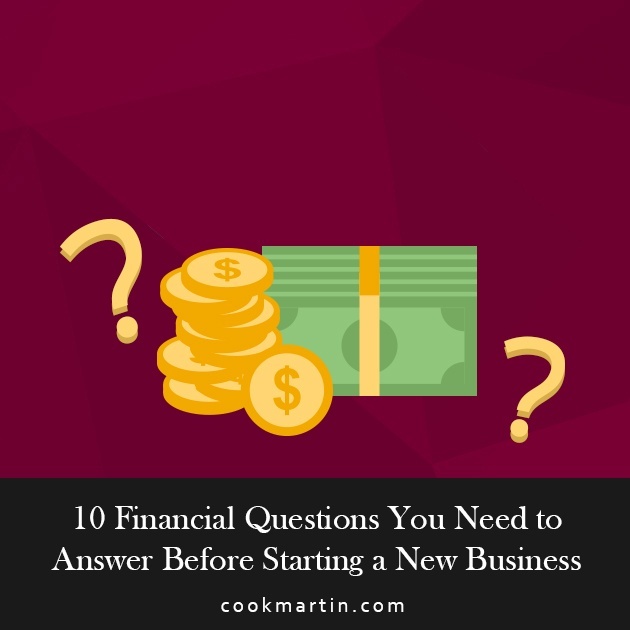 If you are thinking about starting a new business, it’s important to answer some basic financial questions before you do. Knowing the answers to these things will help you avoid some of the most common pitfalls faced by small business owners, giving you a higher chance of success. Before you spend any money on a new business, you need to ask yourself the big question: What problem is your product or service solving? The most successful entrepreneurs always ask this question because they understand that it’s the key to success. When you can provide a solution to a problem, then you know there’s an audience waiting for you. Answering this question will require you to do some research. You’ll need to confirm that people want what you’re selling before you sink any money into your idea. 2. How Much Money Can I Afford to Risk? Some businesses require a large amount of start-up capital while others can be started on a shoestring. The next question you need to ask is what you can afford to risk. If you have capital of your own, you must be realistic about the chances of losing it. The truth is that 9 out of 10 startups fail. That’s a scary statistic, but that’s why you need to consider your tolerance for risk before you get going. 3. What Funds Do I Need to Start? The next question is related to the last one. You might be willing to risk a little or a lot of your personal savings, but you need to think about how much you need to get started. These things can add up quickly. Of course, you may be able to get financial assistance, but that’s the next question. 4. Where Can I Find Capital Financing? If you don’t have (or aren’t willing to risk) the full amount to start a business, you’ll have to find the capital somewhere else. For that reason, you need to give some thought to where you can find it. How hard you’ll have to work to get the capital you need will depend on your willingness to approach people and how much you need. For some people, the thought of approaching non-traditional lenders is an unappealing one. You’ll have to decide what you’re willing to do to get the capital you need. 5. What Makes My Business Special? You might have a very good idea for a company, but are you sure you’re the first one to think of it? Competitor research is a must, and it should happen before you sink any money into your new enterprise. You should start by doing basic research to determine who your competitors are. Make notes about what they’re doing and how they’re doing it because this will help you differentiate your product or service from theirs. The classic example here is Schlitz Beer. At the beginning of the 20th century, it was common for brewers to claim that their products were pure – but they never talked about what it meant. Legendary ad man Claude Hopkins took Schlitz from number five in the market to number one simply by explaining in ads what “pure” meant – at least by Schlitz’s standards. 6. What Corporate Structure Should I Use? The corporate structure you use can have a significant impact on your new business, and it’s important to have an idea of what you want to do before you get started. You should review your options and consider the pros and cons of each before committing to a corporate structure. 7. What Are My Long-Term Goals and How Will I Reach Them? A lack of long-term planning can be the downfall of any startup, so it’s your job to do as much preliminary planning as possible. Of course, it’s impossible to predict every twist and turn in the road ahead, but you need to try to anticipate as many questions and complications as you can. Planning for contingencies can help you fine-tune your corporate documents. Where do I see this business going in the future? What short-term goals do I need to meet to achieve my ultimate goal? What are the specific steps I need to take along the way? How much time will I need to achieve my goals? This is the step where you should be writing your business plan. The more detailed you are, the less likely it is that you’ll be sidetracked or blindsided by a problem. 8. How Flexible Can I Be? This question is an important one because it gets to the heart of your resilience and willingness to roll with the punches. It’s common for entrepreneurs to fail because they put blinders on and fail to see the changes they need to make to succeed. You must be willing to take advice from others when necessary and to acknowledge your weaknesses. 9. Do I Have a Support Network? Starting a business is a lot of work. It’s a huge investment of time, money, and passion, and it can be grueling. You need to have people you can turn to for help, guidance, or a shoulder to cry on. Having a support network in place is essential because even if you’re starting up as a sole proprietor, you can’t do it in a vacuum. You’re going to need people around you. Some may be contractors, others may be gurus or coaches, and some may be people you love who you know will support you. 10. What Else Do I Need to Get Started? Finally, you need to ask yourself what else you need to get started. For some business types, you’ll need to think about licenses, certifications, and other legal specifics. In the course of your research, you should have discovered what you need. It’s crucial to take care of the details and ensure that you can start your business without running afoul of laws and regulations. Make a list of the requirements and then work through them as needed. Being meticulous about such things will serve you well in the long run. Starting a business is a lot of work, but answering these ten questions before you do it can help you avoid much of the frustration and heartbreak that entrepreneurs face. Contact a certified CPA if you have any questions about how to get your new business off the ground. What Are the Tax Differences Between Salary and Hourly Employees?